Established in 1982, Delta is one of the most respected and revered manufacturers of luxury writing instruments. Based in the south of Italy, Delta have become renowned for innovation in design and the materials used in the construction of pens – for example, Delta were the first company to utilise carbon fibre and titanium. Delta are well known amongst pen enthusiasts and collectors for their limited edition pens, for which they have won awards. Delta were also chosen to present pens to world leaders at the 1994 G7 summit! Delta are best known for their Dolcevita collection, finished in their trademark orange. Delta's Dolcevita collection was later expanded with the introduction the Dolcevita Soiree; an elegant collection of black writing instruments beautifully offset with highlights of orange.. If you cannot find what you are looking for please contact us as we are able to supply you with any item from the Delta writing instrument collection. 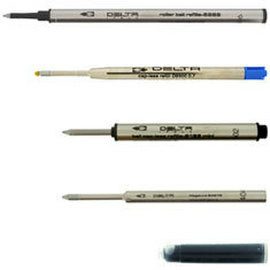 We supply the complete range of Delta pen refills, fountain pen inks, ink cartridges and pencil leads.